Our event, which last year was enjoyed by over 500 guests, will begin with our VIP Cocktail Reception from 6:00 – 7:00 pm, featuring a special Tasting Menu donated, created and presented by acclaimed chefs and restaurateurs. Our main Reception will include an Honoree Presentation, a buffet dinner catered by Elegant Affairs Catering, live and silent auctions, and a very special performance by Livingston Taylor, who has shared the stage with major artists such as Joni Mitchell, Linda Ronstadt, Fleetwood Mac, Jimmy Buffett, and Jethro Tull. Dancing to the spirited sounds of an 80s band in celebration of our 30th anniversary will follow and conclude at 11:00 pm. Dr. Demian Chapman, the recipient of The Alan Rabinowitz 2019 SoFo Species Visionary Award, named after SoFo’s great friend Alan, who until his passing in 2018 was the leading big cat conservationist for the Wildlife Conservation Society and Panthera, that he co-founded. Dr. Demian Chapman, Project leader of Save our Seas Foundation, is an internationally recognized shark expert whose efforts have contributed to species protection in The Bahamas, improved shark management in Belize, and the listing of multiple shark and ray species on the Convention on International Trade in Endangered Species (CITES), to name a few. 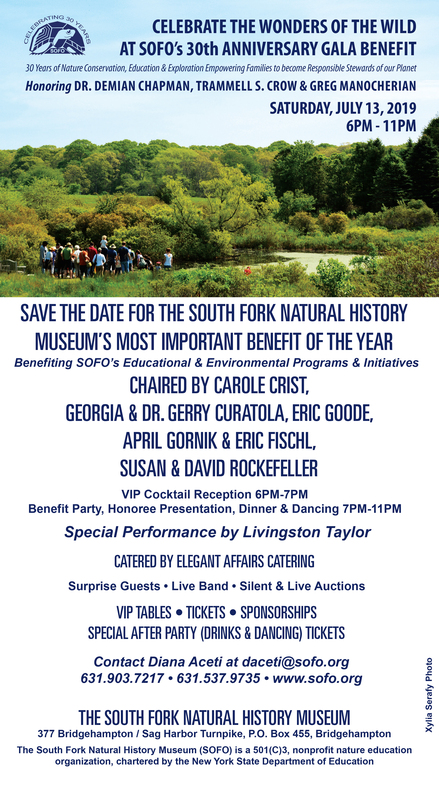 Trammell S. Crow will be the recipient of SoFo’s 2019 Environmental Education Visionary Award in recognition of his work in advancing sustainable and resilient communities to best support Earth’s natural systems, stem climate change, protect human health and improve livability for all. Trammell is a Dallas, Texas-based businessman, philanthropist, and innovative leader. The Founder of Earth Day Texas, the world’s largest Earth Day celebration, Trammell serves on the Board of Directors of Million Acre Pledge, a 501(c)(3) charity that commits individuals, businesses and foundations to conserve or restore large areas of forest and other bio-rich natural areas to save irreplaceable ecosystems. Honoree Greg Manocherian will receive SoFo’s 2019 Environmental Excellence Humanitarian Award. With over 25 years of real estate experience, Greg is the founder of RoeCo. Holdings LLC, and a principal of The Manocherian Organization. In 1994, Greg founded The Roe Foundation (RF), a 501c3 private foundation with two primary goals: wildlife conservation and HIV prevention. RF has played a leadership role in partnership with Wildlife Conservation Society and the government of South Africa in having Great White Sharks internationally protected through CITES in 2004. Since then, the RF has been instrumental in getting an additional 25 species of sharks and rays protected, as well as helping protect large areas of ocean (especially breeding grounds). 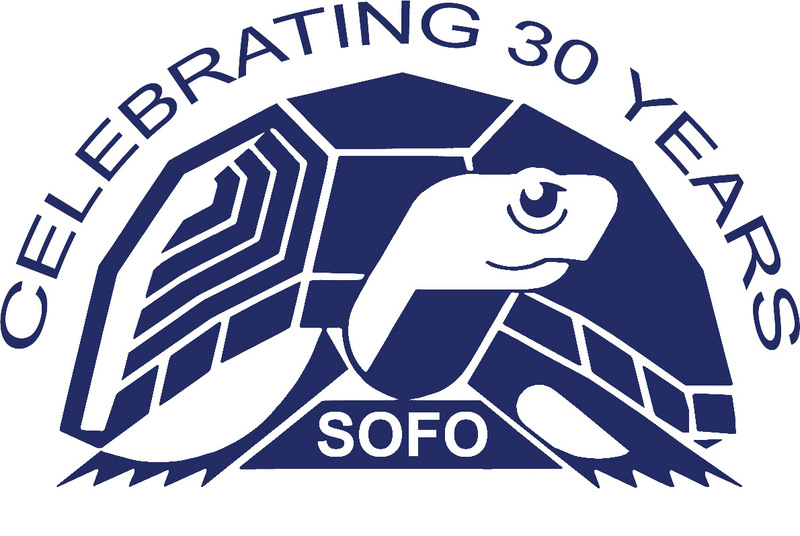 Greg is a longstanding supporter of SoFo.